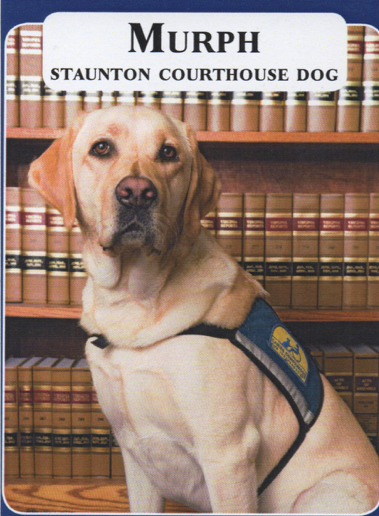 Janet Balser, Director of The City of Staunton Victim/Witness Program operating out of the Commonwealth Attorney’s office, paid a us visit along with Murph, the Staunton Court House Facility Dog. Janet saw the value of having a canine companion dog available as a source of comfort for witnesses or victims of crimes when they are called upon for an interview by court officials or for a court appearance. These are stressful situations for anyone, but especially for children who have suffered abuse or witnessed terrifying events. Janet applied about five years ago for a dog and was accepted for a two week training program in 2017 when she was introduced to Murph and given responsibility for his care. Canine Companion dogs begin their training at birth and are then passed on to puppy raisers who continue their training and socialization up to the age of 16-18 months. Murph’s mellow nature made him particularly suited for his role. He was named for Lt Michael Murphy, a navy seal who received a medal of honor for his service in Afghanistan. He has been tested and met the standards set by Assistance Dogs International and has become a beloved member of the Balser household.